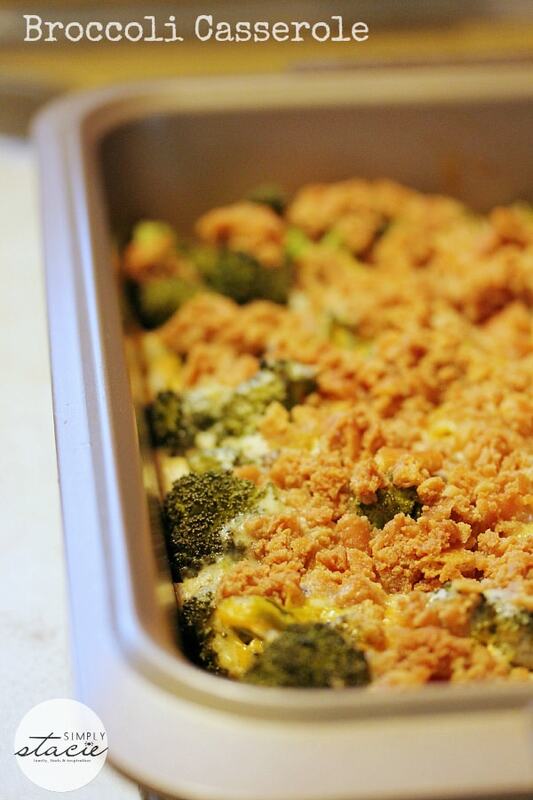 This Broccoli Casserole recipe has been a staple in my family for as long as I can remember. My mom used to make it as a vegetable side dish for our Thanksgiving and Christmas dinners. When I moved out on my own, I asked her to write down the recipe for me so I could make it too. It’s not low on calories, but it sure is good. 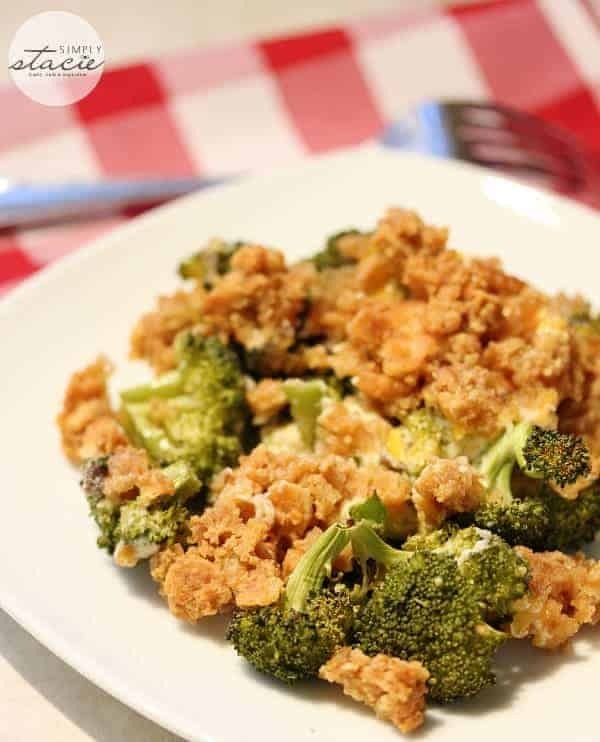 Picture cheesy broccoli in a creamy mushroom sauce topped with a buttery cracker topping. I’m not sure what is my favourite part: the topping, broccoli or the sauce. 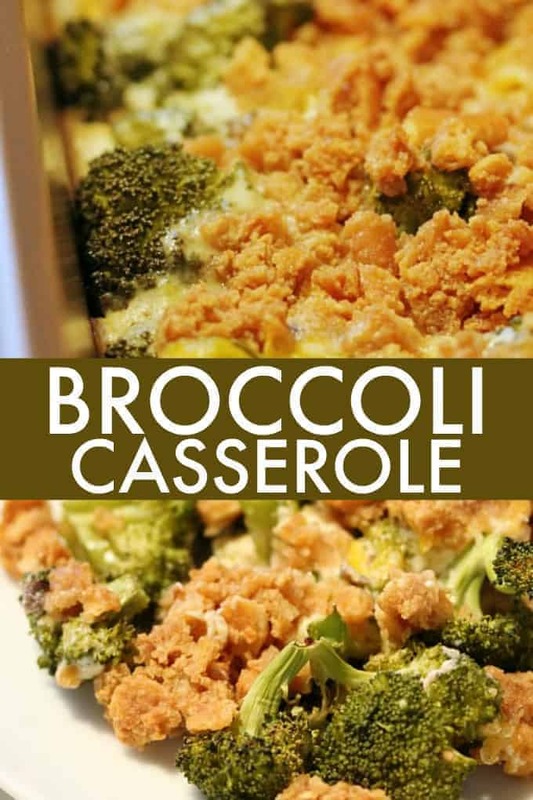 My daughter loves this casserole and even asks for seconds. When I make it for supper, there is rarely any leftovers. It’s gone before you know it! I’ve only ever made it with broccoli, but I’m curious to see how it would taste with cauliflower or with a different cream-based soup. Do they still make Cheddar Cheese soup? I think I might have to buy a can if they do and try it instead of the cream of mushroom variety. You might also like this Cheesy Corn Casserole. 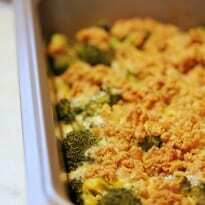 Delicious recipe for Broccoli Casserole made with cream of mushroom soup, Ritz crackers and loads of cheddar cheese. Spread broccoli and onions over the bottom of a 9×13 baking pan. Top with grated cheddar cheese. In a medium sized bowl, stir together soup, milk, mayonnaise and egg. Pour over the broccoli mixture. In a small bowl, mix together Ritz crackers, milk and butter and crumble on top of baking pan. Bake for 40 minutes until topping is lightly browned. This sounds like a healthy and hearty casserole for supper and really easy to prepare. I have saved this recipe to my favorites. Thank you for this recipe.